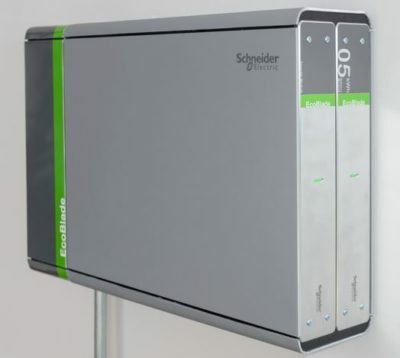 Schneider’s EcoBlade solar battery is a smart energy storage system that changes how your home interacts with the grid. This gives you cleaner and cost-effective power. This scalable energy storage solution consists of batteries, appliances, and pre-designed systems to support smart energy management. The EcoBlade can be used for homes, businesses, commercial buildings, data centers, and entire grids. How does it work? HOW DOES THE ECOBLADE HARNESS ENERGY? The lithium-ion storage system consists of building blocks that can be fit to meet certain needs, designs, and storage capacities. The sleekest of the solar batteries, the EcoBlade is similar in size to a 30″ flat screen television. The “blades” are each individual solar battery, which weighs around 55 lbs. These can be combined and configured to create the ultimate storage system. WHAT DOES DEPLOYING & SCALING THE SYSTEM MEAN? The EcoBlade is different than other solar batteries because it is not based on cell chemistry. It is made from the same science behind IT technology. This means that it is more focused on intelligent battery management, by allowing customers to manage the battery system through the Internet. This makes the energy easier to control, and deploy at will. The EcoBlade is coming from a different side of solar energy and conservation. The IT technology could be a game changer, as it gives users more control than ever over the use of their solar energy reserves. WHAT IS THE BACK-UP ENERGY LIKE? The lithium-ion technology is the missing link. This allows customers to stock and de-stock energy whenever needed, and tailor to the needs of the customer. The technology in the EcoBlade “knows” how energy is consumed through the day, so it optimizes the behavior to disperse the collected solar energy when needed. At the price of $500/kWh, the EcoBlade is becoming a serious competitor within the solar battery world.